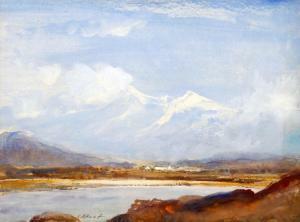 Find artworks, auction results, sale prices and pictures of Cecil Arthur Hunt at auctions worldwide. § Cecil Arthur Hunt, VPRWS, RBA (British, 1873-1965) View of Glen Etive, Highlands signed lower left "C A Hunt" and inscribed lower right with title watercolour 24 x 34cm (9 x 13in) Other Notes: Son of the renowned geologist Arthur Roope Hunt, Cecil Hunt originally studied Classics and Law at Trinity College, Cambridge. He was called to the bar in 1899 and chose to practise the law in spite of his artistic predilections. 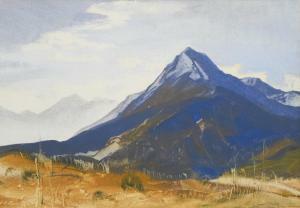 Following his first exhibition at the Alpine Club Galleries in 1900, he gained a reputation as an atmospheric painter of mountains, particularly the Alps and Dolomites. He travelled extensively and exhibited his works. Among his favourite locations were the West Country, the West Coast of Scotland, the Rhone Valley, Northern Italy, Rome and Taormina. He regarded his painting as a pastime until 1925 when he was elected a full member of the Royal Society of Painters in Water-Colours. Unframed and colours are good. CECIL ARTHUR HUNT, V.P.R.W.S., R.B.A. 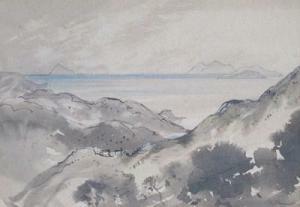 (british, 1873-1965) "GLASTONBURY TOR" Signed bottom left, titled verso, watercolor and gouache on paper. 11 1/8 x 15 in. (28.3 x 38.1cm) provenance: Chris Beetles Limited, London, United Kingdom. Patricia & John Roche, New York, New York. exhibited: Frost & Reed Limited, London, United Kingdom, 1955 (exhibition no. 2). "Cecil Arthur Hunt : V.P.R.W.S., R.B.A., 1873-1965," Chris Beetles Limited, London, United Kingdom, October 1966 (exhibition catalogue no. 2). 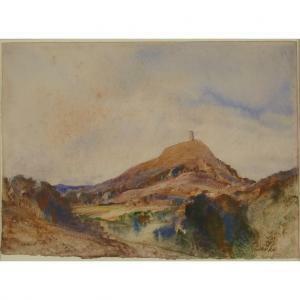 note: As per label verso, Hunt visited and sketched Glastonbury Tor in 1922, 1928 and again in 1930. 28 x 38cm (11 x 14 15/16in).